The weekend of January 26th & 27th, a very exciting two-day event will be held at the University of Greenwich, titled "Electroacoustic Music in Great Britain: Past/Present/Future". 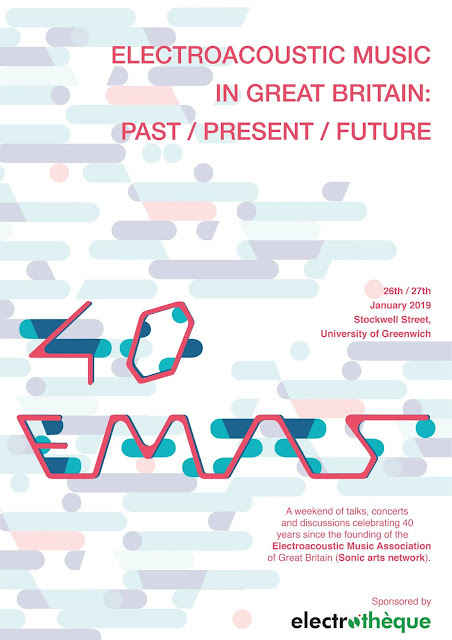 Co-organised by BEAN (British ElectroAcoustic Network) and the School of Design of the University of Greenwich, the event celebrates the 40th anniversary of EMAS (the Electroacoustic Music Association of Great Britain), with a weekend of talks, concerts and discussions celebrating the achievements of Electroacoustic music in the UK, together with discussion of how best to move forward as a community. MTI² will be well represented, with talks and concert works by Professors Simon Emmerson & Leigh Landy and graduates Dave Holland, Louise Rossiter & Andrew Hill, and with lecturer James Andean active as one of the organisers of the event. In addition, a number of concerts across both days will also include works by Trevor Wishart, Denis Smalley, Jonty Harrison, Katharine Norman, Pete Stollery, Christian Eloy, Jo Thomas, Evelyn Ficarra, Rolf Gehlhaar, Aki Pasoulas, Andrew Lewis, Ambrose Seddon, Emma Margetson, Nikos Stavropoulos, and plenty more!